It’s always nice to beat up on the teams you’re supposed to crush, and that’s exactly what the Yankees did in their 12-1 rout of the Marlins on Monday night. The 11-run win was their second-largest in an Interleague game at Yankee Stadium, trailing only their 15-0 shellacking of the Mets in 2009. The fireworks started early and didn’t let up, with the Yankees racing out to leads of 5-0 after at the end of the third and 11-0 at the end of the fifth. The Yankees have made a habit out of taking big leads recently. Since the start of last season, it was the 61st game in which they’ve had a lead of at least five runs. That’s four more such games than any other team in MLB through Monday’s slate (Astros were second with 57). Aaron Judge continued his destruction of baseballs and record books, going deep in the second inning for his 60th career homer. It came in his 197th big-league game, making him the fastest player in major-league history to hit 60 homers, needing five fewer games than Mark McGwire. 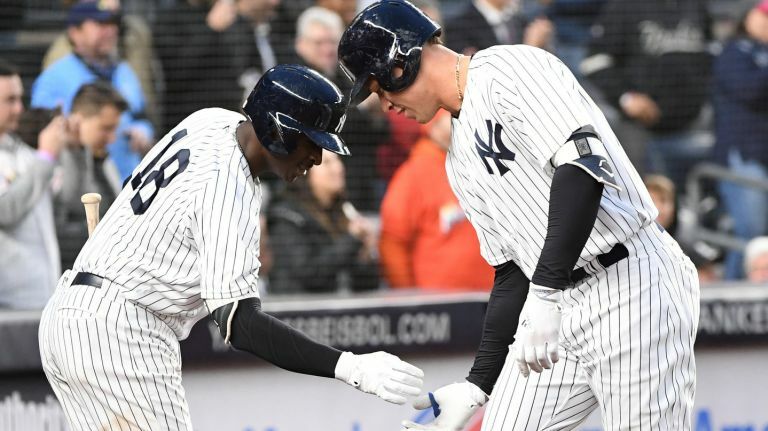 Didi Gregorius somehow upstaged Judge by knocking two balls out of the park for his second multi-homer game in 2018. As of Monday, he was the only player in the American League with two multi-homer games this season. It was also his fifth homer of the year — #FunFact alert! — which is the same number that the Tigers and Royals each had as a team entering this week’s schedule. In terms of piling up two multi-homer games this early into the season, Didi has put himself in some elite company. Only four other Yankees have done it twice in the team’s first 15 games since 1950: Alex Rodriguez (2007), Graig Nettles (1974), Mickey Mantle (1961) and Bill Skowron. These were not Yankee Stadium cheapies, either, with distances of 411 and 416 feet. As of Monday, only six other guys had a game with two 410-foot-plus homers: Justin Smoak, Khris Davis, Javier Baez, Matt Davidson, Tyler Austin and Giancarlo Stanton. Luis Severino bounced back from his rough outing at Fenway last week to throw an absolute gem. He gave up just one hit over six scoreless innings, walking one and striking out eight. Amazingly, its his second start this season with at least seven strikeouts and no more than one hit allowed. He’s the first pitcher in franchise history with two such games in a single season. Reminder: it’s the middle of April. The only other major-league pitchers in the last 110 seasons to have two such starts within the team’s first 15 games are Bob Feller (1947) and Sam McDowell (1966). So who are the real Yankees? 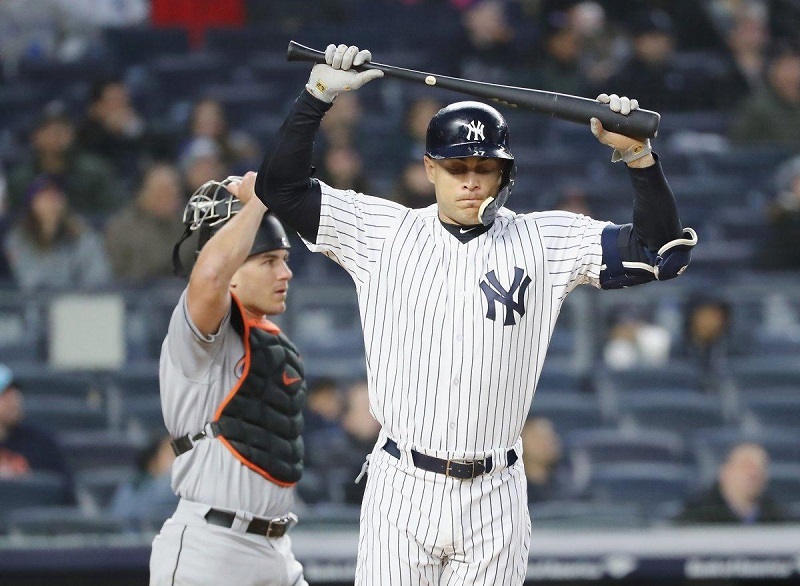 One day after posting their most convincing win of the season, the Yankees flopped in epic fashion on Tuesday night as the Marlins pummeled them, 9-1. Three weeks into the season and the Yankees are doing their best to define mediocrity. For example, their record after each of their last 10 games (starting April 5): 4-3, 4-4, 5-4, 5-5, 6-5, 6-6, 7-6, 7-7, 8-7, 8-8. Yes, he was hurt by a couple untimely errors behind him, but he didn’t help himself by allowing a ton of hard contact. 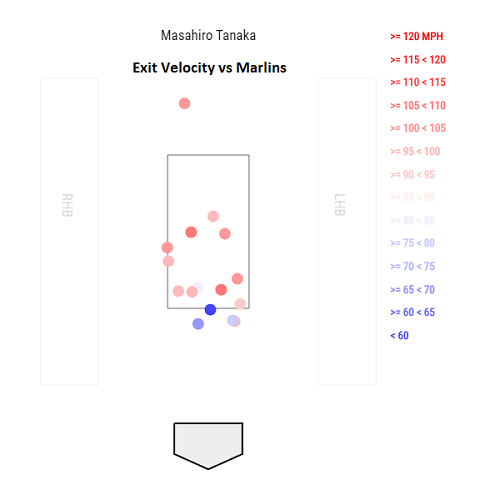 Eleven of the 17 balls in play against Tanaka had an exit velocity of at least 96 mph, easily the most such batted balls given up by a Yankee pitcher in a game this season. Giancarlo Stanton was booed yet again at the Stadium as he went 0-for-4, striking out twice, grounding into a double play and popping out with two men on base. It was his sixth game this season with multiple whiffs and no hits, the most by any Yankee in the team’s first 16 games. It’s a super-small sample size, but the hometown fans have good reason to spread the Bronx jeers when he’s at the plate: Stanton is now 3-for-35 (.086) with 20 strikeouts in eight home games, compared to 10-for-31 (.323) with nine strikeouts in eight road games. The 23-year-old Andujar is the youngest Yankee in more than 50 years to put together a streak of back-to-back-to-back games with at least two extra base hits. The last one to do it was a Brooklyn-born, 21-year-old rookie named Joe Pepitone in 1962.